Why a Gentleman’s Walking Umbrella? Walking umbrellas have a history dating back to ancient civilisations when parasols were carried by slaves and servants to shade their well-to-do masters from the blaze of the sun. With the passage of time, parasols became a purely feminine accessory, used to protect delicate skin from the sun and clothes from damage caused by the rain. Until, in the late 1800s, Jonas Hanway, an English traveller and philanthropist, fed up with suffering the effects of the rain, was said to be the first Londoner to carry an umbrella. Initially ridiculed, his peers soon saw the wisdom of Jonas’ ways and followed suit, adopting the umbrella not just as an essential wet weather item but also as an elegant accessory in its own right. 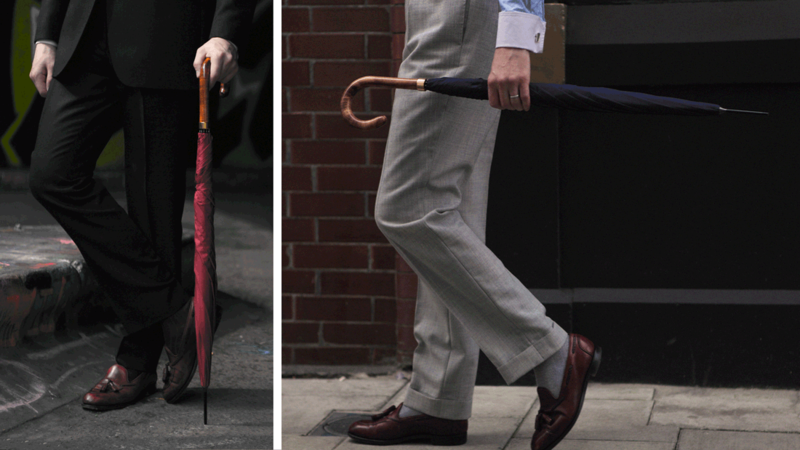 Thus the walking umbrella became synonymous with the British gentleman and, due to our reliably soggy weather, continues to be one of his most indispensable companions. 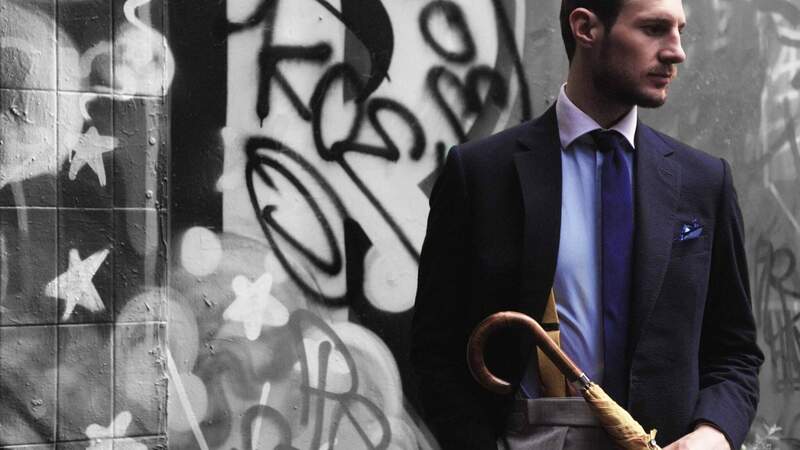 There is something truly elegant about a man carrying a full size walking umbrella and the modern gent knows it is a vital part of any self respecting wardrobe. Making an investment in a quality umbrella not only raises your style game but should also be a trusty wet weather companion, built to last. At Cad & The Dandy we stock a colourful range of traditional full size walking umbrellas. While most men will opt for a navy blue or black, it’s wise to consider how our colour choice can add impact to your overall look and style. Selecting a brighter or more unusual shade will add flair to any well thought out ensemble and highlight your individuality. 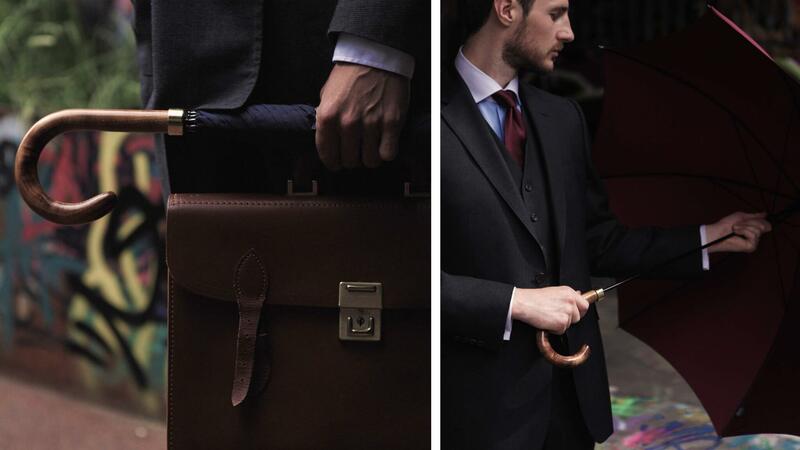 Doubling up as a walking stick, our well-crafted gentleman’s walking umbrellas are hard to beat, with their solid maple wood hook handles, metal cuffs and slim black frames. Their wide canopies and deep domes give excellent dry coverage but it is against the wind that these umbrellas truly excel. The construction of the canopy, frame and shaft all combine to prevent them from blowing inside out in high winds. Essential on those blustery wet days, of which we have so many. Our full size walking umbrellas are not only practical tools for protection from the elements, but also serve to enhance one’s business or formal attire with flair, individuality and a rakish charm.